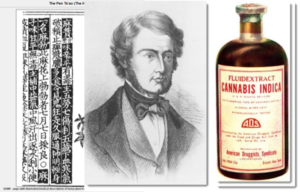 The earliest written recorded use of hemp for health purposes, dates back over forty-seven hundred years1. From the very beginning, this long, evolving, and geographically diverse relationship between human and hemp has always remained multi-faceted. Human interactions with hemp ranged from using stalk and fibrous parts for construction of housing and splicing of ropes, to the production of fabrics. Specifically, hemp seeds were pressed into hemp seed oil and ground into nutritious protein flour and the colorful, aromatic hemp female flowers were used for health and spiritual purposes. 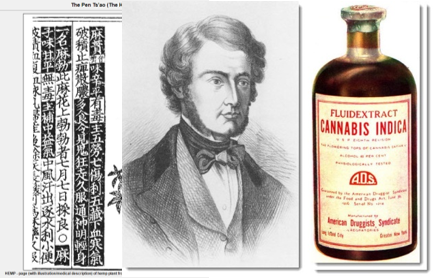 Hemp was also burned as an antiseptic, inhaled in combination with and instead of tobacco, and extracted and infused into water hydrolats or oil balms. Despite this long-standing relationship between humans and the hemp plant, biological mechanisms by which our bodies interact with various hemp components started emerging only in the 1980’s, when an international group of scientists working in Israel had a major break-through. Led by Prof. Raphael Mechoulam, that critical discovery was of the endocannabinoid system (ECS) – a finding that would positively reshape the future of our relationship with the cannabis plant. Until the 1980’s, we did not understand that humans, as well as many different animals, naturally synthesize chemical transmitters called endocannabinoids. These endocannabinoid molecules interact with the proteins in our brains and various body organs, called cannabinoid receptors 1 and 2 – CB1 and CB2. Hence, the body’s ECS consists of naturally synthesized endocannabinoids, their synthesizing and degrading enzymes, and cannabinoid CB1 and CB2 receptors2. 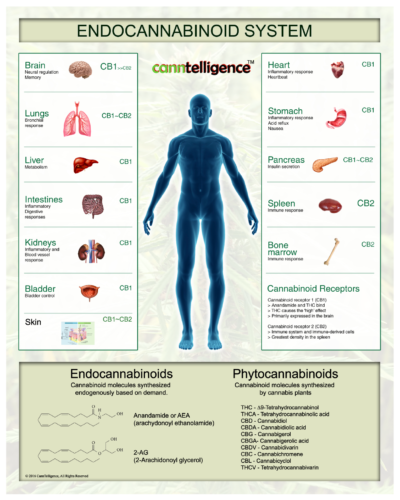 Virtually every organ and cell in human (and mammalian) bodies, contains elements of the endocannabinoid system. CB1 receptors are highly prevalent in the brain cells called neurons. The activation of CB1 receptors by the endocannabinoids, regulates neurochemical communication between neurons3. The CB1 receptors are activated by the endocannabinoids, but also by the phytocannabinoids (naturally occurring organic cannabinoid molecules in hemp). In this way, CB1 receptors interact with endogenous endocannabinoids and exogenous phytocannabinoids. Since CB1 receptors are widely distributed throughout the brain, they are involved in regulating many physiological and psychological functions, but they do not control vital body functions like the heart tone or breathing rate. In the brain, CB receptors are the most prevalent G-protein coupled receptors (a large transmembrane protein complex that can regulate activity inside the cells). In addition to the brain, CB1 receptors can be found in virtually every organ in our bodies, with high prevalence in the digestive system, bladder and heart4. Unlike CB1 receptors, CB2 receptors are strongly associated with the immune system and are predominant in body organs that are involved in amassing the immune system response, such as, the spleen, bone marrow, pancreas, and lungs. Nonetheless, CB2 receptors are also found in the brain, on a type of cell called glia. In the brain, a glia cell subtype called microglia are activated during an injury, or a state of disease, or infection. Microglia respond by producing cytokines, which allow for the immune response to get engaged and for proper cell-to-cell communication to occur. However, unregulated cytokine release or dysfunctional CB2 receptors, can cause neurotoxicity and neuronal death. In contrast, CB2 receptor activation regulates oxidative damage and cytokine release in the brain5. In addition to the brain and visceral organs, both CB1 and CB2 receptors and endocannabinoids are also found widely in the largest organ of the body – the skin. In the skin, CB1 and CB2 receptors are found in nerve endings, ‘epidermal keratinocytes, and the epithelial cells of hair follicles, sebocytes and eccrine sweat glands’. In this manner, CB1 and CB2 receptors and the ECS form an intricate regulatory and homeostatic network from the deepest to the most superficial cells and tissues. The endocannabinoids (anandamide (AEA) and 2-arachidonoylglycerol (2-AG)) that target CB receptors are synthesized by our bodies6 and released on demand, during heightened levels of stress on the brain and the body. As such, they serve as one of the body’s regulatory molecules, operating in a negative feedback fashion and regulating abnormal brain-body activity. Endocannabinoids are lipid soluble and are not stored in vesicles, like traditional neurotransmitters. When endocannabinoids are released in the brain, they bind to CB1 and CB2 receptors on neurons and glia. What is the relationship between the endocannabinoid system and hemp plant? The recent discovery of the endocannabinoid system and the associated scientific and clinical discoveries, have once again reignited our interest and perhaps even trust in the inherent therapeutic properties of cannabis and its components. Discovery of one of the major phytocannabinoids – CBD in the lab and the green houses, and its recent emergence on the global market, as a safe, non-psychotropic cannabinoid was a game changer. But how does CBD and hemp oil interact with the ECS? CBD binds to CB1 receptors, but it does not bind in a way that it causes a psychotropic effect. Psychotropic effect is different from a substance being psychoactive. Indeed, even coffee is psychoactive, which means that caffeine fromcoffee, gets into the blood from the digestive system, crosses the blood-brain-barrier, and binds to the caffeine (aka adenosine) receptors in the brain. Caffeine binding to adenosine receptors increases brain activity, by facilitating an increase in release of excitatory neurotransmitter glutamate. Cup of coffeeaffects your behavior accordingly, but it does not cause you to feel ‘high’. Much in the same way as caffeine, CBD affects brain activity, but it does not have psychotropic properties. CBD IS PSYCHOACTIVE, but NOT PSYCHOTROPIC. CBD binds to and is an allosteric modulator of CB1 receptors. Unlike THC, it does not bind to the primary binding site of CB1 receptor proteins, but rather at a different, remote site. Bound in this allosteric position, CBD modulates the interactions between the molecules that bind CB1 in the primary binding site, which include psychotropic substances. In addition, CBD also interacts with serotonin receptors, vanilloid receptors, a receptor called GPR55, and PPAR nuclear receptors. Thus, CBD has a multitude of targets and functions in the body, within and outside of the ECS7. What in hemp activates CB2 receptors? In addition to phytocannabinoids, the hemp plant contains a variety of aromatic terpenes. When properly preserved and processed, the hemp plant can yield several percentages of terpenes in the biomass. Often, the biomass made from distinct hemp strains will contain a variation of terpenes. Terpenes, are not just molecules that give plants their pleasant aromas. Terpenes have their own distinct physiological functions and even interactions with the ECS. 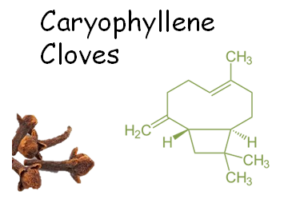 For example, one of the most common terpenes found in hemp is caryophyllene or beta caryophyllene (BCP). 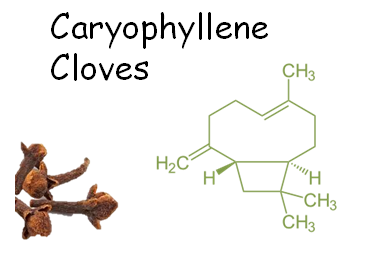 BCP is also widespread in hops, peppers, and cloves8. BCP is a selective CB2 receptor activator (agonist). Hemp CBD preparations and full spectrum CBD oils that contain significant levels of BCP, and other terpenes and molecules will more fully engage the endocannabinoid system, regulating brain-body homeostasis. Endocannabinoid deficiencies are thought to be disorders that stem from the lack of proper ECS functions. These disorders are usually hyperalgesia: Migraines, fibromyalgia, irritable bowel syndrome, neurotransmitter disorders, and epilepsies (Dr. Ethan Russo). Russo, E. B. & McPartland, J. M. (2003) Cannabis is more than simply delta(9)-tetrahydrocannabinol. Psychopharmacology (Berlin). Mechoulam R, Parker LA. (2013) The endocannabinoid system and the brain. Annu Rev Psychol. Kano M, Ohno-Shosaku T, Hashimotodani Y, Uchigashima M, Watanabe M. (2009) Endocannabinoid-mediated control of synaptic transmission. Physiol Rev. Caroline Turcotte, Marie-Renée Blanchet, Michel Laviolette, and Nicolas Flamand. (2016) The CB2 receptor and its role as a regulator of inflammation. Cell Mol Life Sci. Which Hemp CBD Oil to Use: Full Spectrum, Broad Spectrum, PCR Oil, or Isolate?